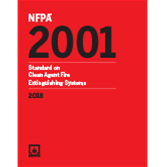 Get a clearer picture on clean agent systems with the 2018 edition of NFPA 2001. Everyone responsible for fire protection of IT/telecommunications equipment, high value assets, or marine vessels needs NFPA 2001, Standard on Clean Agent Extinguishing Systems to keep pace with the latest design and maintenance requirements plus complete facts on the different types of halogenated and inert gas extinguishing agents in use today. Now featuring a reorganized, more user-friendly format, the 2018 edition of NFPA 2001 has essential requirements on how to properly purchase, design, install, test, inspect, approve, operate, and maintain engineered or pre-engineered gaseous agent fire suppression systems so they will function as intended when needed. Revisions in the 2018 edition of NFPA 2001 help improve safety and reliability. Separate chapters on Installation Acceptance and Inspection, Servicing, Testing, Maintenance, and Training better define the application of inspection and testing requirements to new and existing systems. Integrated fire protection and life safety system testing must be conducted in accordance with NFPA 4, Standard for Integrated Fire Protection and Life Safety System Testing. An egress time study is required for all clean agent systems, not just those where the design concentration is greater than the no observable adverse effects level (NOAEL). Dirt traps must be installed at the end of each pipe run. A must for building or marine vessel owners, installers, maintainers, manufacturers, and AHJs. Interested in other editions of the NFPA 2001? Use the drop down menu above to select the edition year you need. 1.8 Compatibility with Other Agents. 4.3 Detection, Actuation, Alarm, and Control Systems. 5.1 Specifications, Plans, and Approvals. 5.8 Nozzle Choice and Location. 6.5 Location and Number of Nozzles. 7.4 Review of Mechanical Components. 7.5 Review of Enclosure Integrity. 7.6 Review of Electrical Components. 8.3 Semiannual Service and Inspection. 8.4 Annual Inspection and Service. 9.5 Detection, Actuation, and Control Systems. 9.6 Additional Requirements for Systems Protecting Class B Hazards Greater Than 6000 ft3 (170 m3) with Stored Cylinders Within the Protected Space. 9.10 Nozzle Choice and Location. Expanded with new coverage about environmental safety and new types of systems in use today, NFPA 2001: Standard on Clean Agent Extinguishing Systems provides essential requirements on how to properly purchase, design, install, test, inspect, approve, operate, and maintain engineered or pre-engineered gaseous agent fire suppression systems so they will function as intended when needed.